It looked as though summer had finally arrived here in Rexburg. Until the clouds came today. It looks like rain and clouds will be here all week. But that isn't stopping me from using my awesome new Elle's Studio summer tags. While this photo was taken back in May, I used the "Photograph #001" tag, because it feels like the first summer picture I really took. One without jackets or socks, just us outside, playing, and enjoying the sunshine. 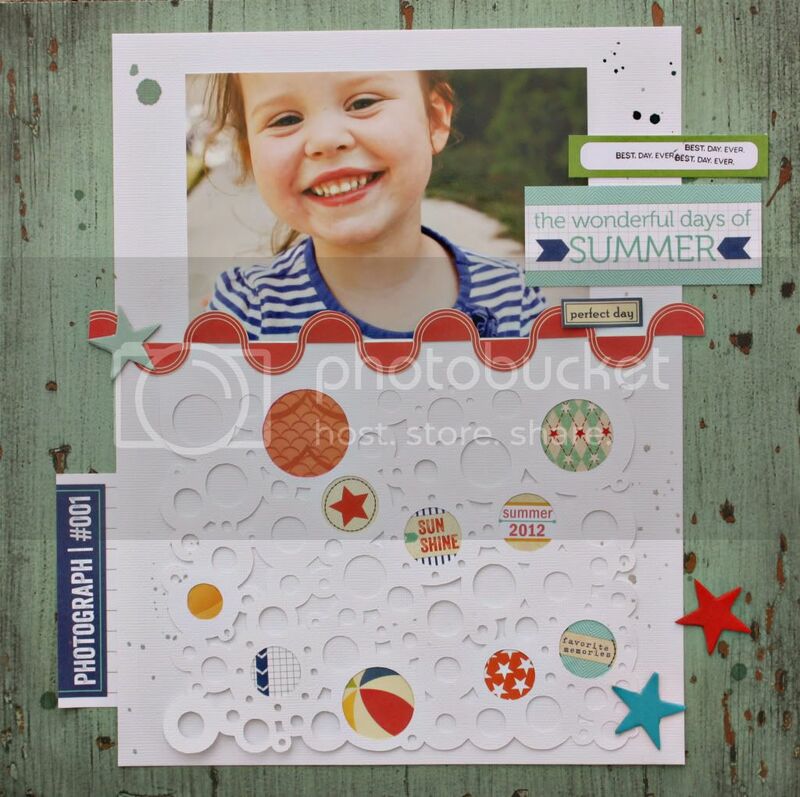 I used this shape from Silhouette for the bubbles and then filled them in with Elle's Studio summer tidbits, as well as varying papers from my stash. I added some other tags from the Summer Lovin' collection and some washi tape covered chipboard stars as accents. I dribbled some Mister Huey (Lunchbox, Clay, and Heirloom Blue) for good measure. After moving my craft room into our bedroom over the weekend, I was forced to realize how much stash I really have, so I am making an effort to use it up - even if it's in small bits. I saw a Summer Manifesto, over on Jenni's blog and I think I might make one for myself. Or at the very least a bucket list for this summer. We are so close to so many awesome outdoor attractions, we really need to take advantage.